Fernando Hernández Jiménez started his mechanical engineering studies at the Universidad Carlos III in 2003. After obtaining his degree in 2007 at University Carlos III, he obtained his Master in Thermal and Fluids Engineering in 2009. His formation has continued with a research stay at the ETH Zurich, working with Prof. Christoph R. Müller during the summer of 2010, autumn of 2011 and 2012. Fernando obtained his PhD in Mechanical Engineering in October 2013. His research is mainly focused on CFD simulations of fluidized beds, studying its global behaviour and comparing its results with experimental data and theoretical models. 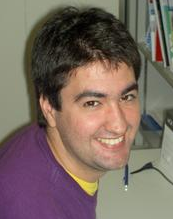 He has also worked on biomass analysis. The Journal of Supercritical Fluids. 2019. Powder Technology, 334, 183-191. 2018. Chemical Engineering Journal, 321, 175-183. 2017. Powder Technology, 308, 346-361. 2017. E. Cano-Pleite, F. Hernández-Jiménez, A. Acosta-Iborra. Chemical Engineering Journal 307 113–121. 2017. J. Sánchez-Prieto, F. Hernández-Jiménez, L.M. Garcia-Gutierrez, A. Soria-Verdugo. Advanced Powder Technology 27 521-530. 2016. F. Hernández-Jiménez, J. Sánchez-Prieto, E. Cano-Pleite, L.M. Garcia-Gutierrez, A. Acosta-Iborra. T. Li, Y. Zhang, F. Hernández-Jiménez. Chemical Engineering Science 134 57-66. 2015. F. Hernández-Jiménez, Garcia-Gutierrez, L.M., Soria-Verdugo, A., A. Acosta-Iborra. Chemical Engineering Journal 271 287-299. 2015. Chemical Engineering Journal 255 114-125. 2014. E. Cano-Pleite, F. Hernández-Jiménez, M. de Vega, A. Acosta-Iborra. Chemical Engineering Science 106 136-143. 2014. F. Hernández-Jiménez, T. Li, E. Cano-Pleite, W. Rogers, A. Acosta-Iborra. Lilian de Martín, J. Sánchez-Prieto, F. Hernández-Jiménez, J. Ruud van Ommen. F. Hernández-Jiménez, J. Sánchez-Prieto, A. Soria-Verdugo, A. Acosta-Iborra. F. Hernández-Jiménez, A. Gómez-García. D. Santana, A. Acosta-Iborra. Numerical investigation on the solids mixing in fluidized beds. Simulation of fuel particles motion in a 2D fluidized bed using a hybrid-model considering wall friction.